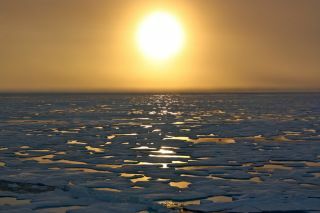 The sun sits low on the Arctic horizon during the NASA-sponsored ICESCAPE mission of 2011 as scientists on board the U.S. Coast Guard Cutter Healy headed south in the Chukchi Sea. The mission studies how changing conditions in the Arctic affect the ocean's chemistry and ecosystems. Today marks the official start of summer in the Northern Hemisphere, and viewers around the world can ring in the new season with a special online webcast to mark the event. The Slooh Space Camera, which broadcasts live views from various telescopes around the world, is hosting a special webcast today (June 20) at 7 p.m. EDT (4 p.m. PDT; 2300 GMT) to celebrate the summer solstice, and to examine the sun's recent activity. The webcast can be accessed by visiting the Slooh Space Camera's website. The northern summer solstice will occur at 7:09 p.m. EDT (2309 GMT), when the sun reaches the peak of its journey northward and begins moving south again. During their broadcast, Slooh will feature two live feeds from the Prescott Observatory in Arizona. Commentary will be provided by astronomer Bob Berman, a columnist at Astronomy Magazine and Matt Francis from the Prescott Observatory, according to organizers of the online event. The webcast will also take a closer look at recent solar storm events in the lead up to the summer solstice. An active region on the sun, called AR 1504, fired off two M-class, or medium-strength, solar flares last week, hurling two coronal mass ejections toward Earth. These eruptions triggered geomagnetic storms over the weekend, as the plasma and charged particles interacted with Earth's magnetosphere. No adverse effects were reported on Earth from the weekend geomagnetic storms, but the amped up solar activity did supercharge normal displays of the northern lights. Stargazers in states as low as Iowa, Nebraska and Maryland were treated to stunning aurora displays, according to NASA officials. The summer solstice marks the time when the sun arrives at its northernmost point in the sky. This celestial positioning kicks off summer in the Northern Hemisphere and winter in the Southern Hemisphere.